Here is a simple recipe from Donna Hay’s latest cook book ‘Fresh & Light’. I have been looking for simple, healthy recipes that are freezer friendly and it has so many easy recipes that use fresh ingredients. Patties, burgers, cakes, rissoles, meatballs… however you want to define food rolled up and then pan fried or baked is fine by me. All I can say is, these little round morsels of food are making a huge comeback in our household these days. It is the ultimate odds and ends recipe, using up odd vegetables and the staple mincemeat or that odd can of chickpeas from the pantry. So this is the start of the Palm series. I say palm as I make them all the size of Rafaela’s palm (the recommended portion size) for her and everyone really. So watch this space, over the coming weeks I will be focusing on all things…. Round! Lentils are a great addition to your little bubba choo’s diet; High in protein, so great for Vegetarians. They also tend to take on the flavours that they are cooked with, Making them very versatile. You might want to start with Red lentils, they are slightly lower in fibre so they don’t produce as much gas as brown and green ones. They also cook to mushier consistency. Some suggestions for Lentil include; cook them in a homemade broth, mash them with vegetables, Use them as a thickener or throw them into a soup or casserole. They would require 20min of cooking. Always thoroughly rinse lentils as they are prone to debris. This recipe calls for a can of brown lentils. These are readily available as all supermarkets. You can also get organic varieties, which I have used below. These little Falafels are very tasty and are not deep fried. Like most falafels, they are best served with a sauce. So I’ve included the one from the original recipe. Rafaela gobbled these down, while smearing the yoghurt sauce all over her face. They freeze really well and are a great meal or snack option. These are perfect for the whole family. I found them a great finger food for parties. 1 x 400g can brown organic lentils, drained and rinsed. Preheat the oven to 220 degrees (450F). To make the garlic yoghurt sauce, combine the yoghurt, garlic, tahini, lemon juice and chives. Set aside. Place the lentils, breadcrumbs ricotta, egg, cumin, coriander, lemon, salt and pepper in a food processor and pulse until the mixture is just combined. 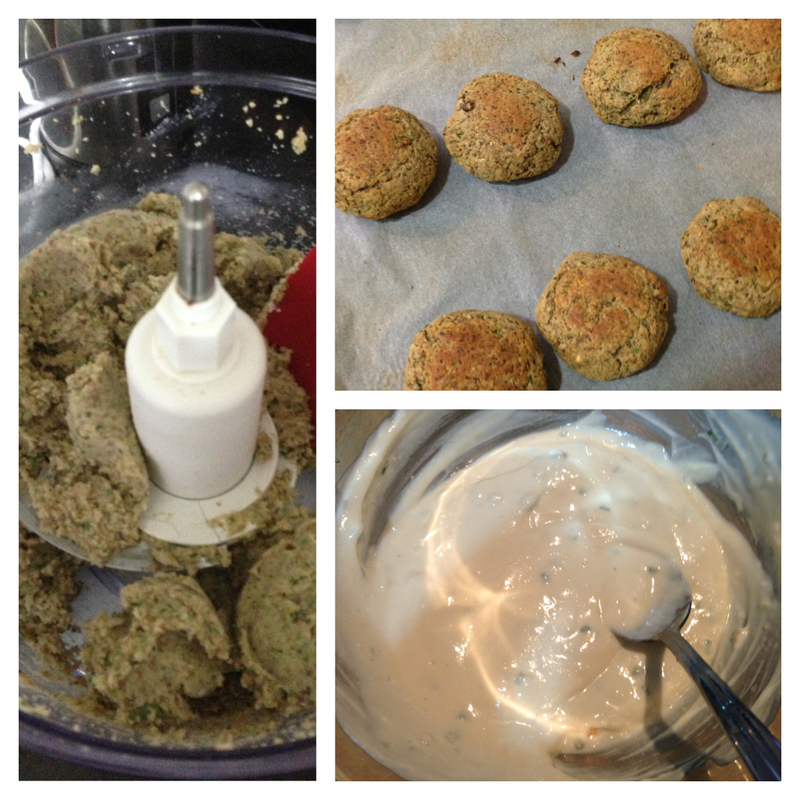 Shape 2 tablespoonful’s of the mixture into small patties and place on a baking tray lined with non-stick paper. Brush the patties lightly with oil and bake for 10 minutes each side or until crisp. Serve with Garlic Sauce. For infants try serving with couscous and vegetables. For older kids & adults, try serving with salad and pita bread. Kirst how old before you can eat garlic? Well it is totally up too you and your bub. From what I can see In most research 8 months is the recommend age. Babies digestive systems are more mature by then. But if your bubba choo is doing well with solids then go for it, just wait for 3 days to monitor and reactions. I started at 8 months with Rafaela, mainly in small amounts and mainly with meats. Garlic, onion, herbs and spices are all the best ways to introduce flavour without salt. It also gets your babies pallet working well so you can eventually have him eating your meals. For example Rafaela has chicken Schnitzel with us, I seasoned her breadcrumbs with dried herbs and parmesan. Our was with a bit of garlic salt and chilli. Hope that helps. Thanks! They are all adult friendly too. Just add a little salt and pepper.